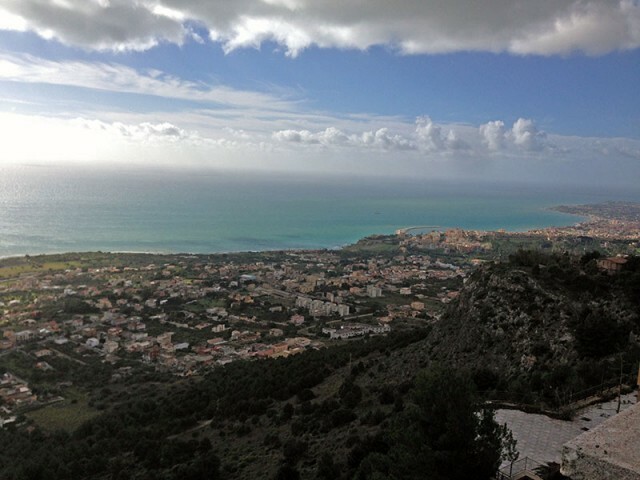 After a quiet November and December, I went to Sicily, with training bike. The weather was excellent 10-18 degrees, mostly sunny – only rain one day. After the persistent drizzle of England in the past few weeks, it was welcome relief. The first day, I had to panic buy suncream and sunglasses, you get out of the habit to think about sunglasses – cycling in the UK mid-winter. 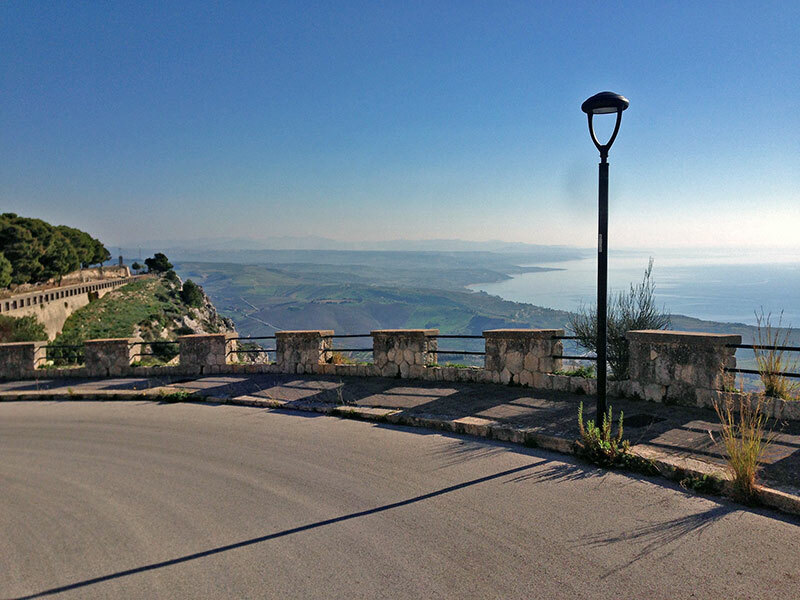 I stayed near a town called Sciacca, the other side of the island to Palermo. The hotel waiter proudly told me he had served Marco Pantani and Miguel Indurain when the Giro passed through here one year. The island is very hilly. If you stay off the main roads, the terrain is constantly up and down. The main roads are more horizontal because of bridges over the innumerable dips. The good news is that the climbs are well engineered, with average gradients of 5% making it all quite palatable. 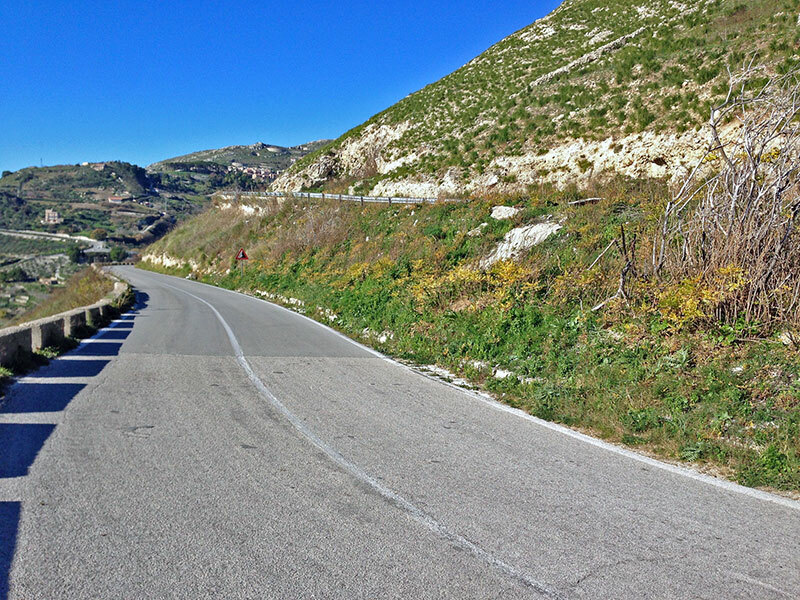 From Sciacca to Caltebellotta there is a 15km climb – which goes from sea level to 930m. It averages 5% and is a great climb to both go up and then come back down. After only a small amount cycling in November and December, I am a little bit out of shape, so the 5% gradient was quite welcome. You can get into a good rhythm and watch the road slowly rise. The descent from Caltebellotta was also very good. You still have to pedal and there are sweeping corners, which are reasonably quick. 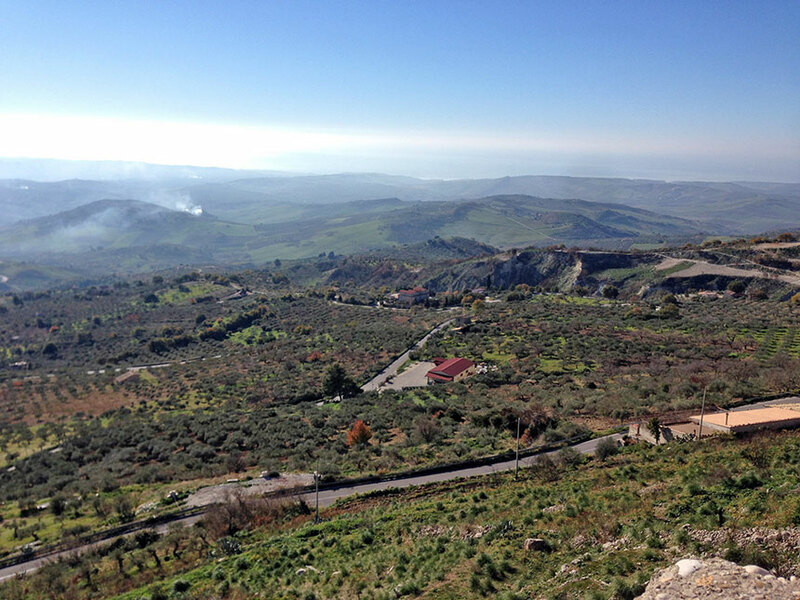 One difference of the Sicilian landscape is that you can see a lot further in the distance. When you set off, you can see the destination – 15 miles away on top of the mountain. In England you would rarely see so far. It appears you are often in a big natural amphitheatre. One day, I took a short cut and came across a climb that was varying between 10 and 15%, it was really a rough farm track and not the most enjoyable. In the hill climb season, I might actively seek out this kind of steep climb, but not in January, when you are not so fit. The food in Sicily was excellent, though I ate more pasta in the past 10 days than I did in the past 12 months. There were lots of barking dogs, but they all looked quite domesticated and well-behaved. Their bark was much worse than their bite, no feral dogs like in Portugal. 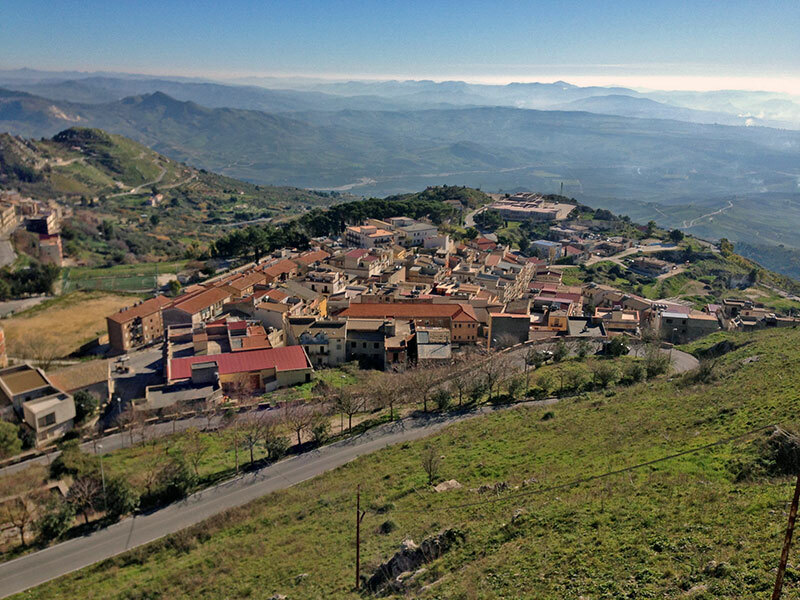 I’m not sure whether it is always so dry and warm in Sicily, but if it was like this it would make an excellent training camp. 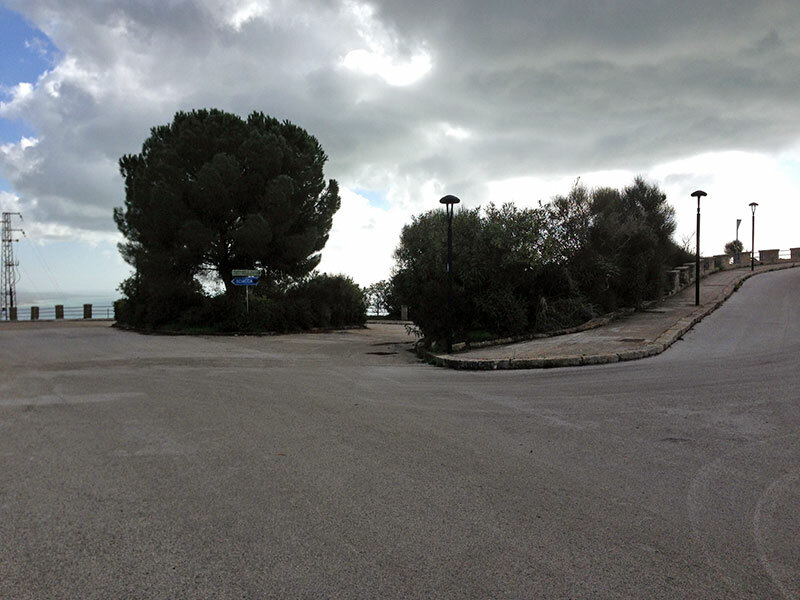 I didn’t venture too far from Sciacca. I didn’t have time for 5 hour plus rides, and was content just to climb up all the local hills. The standard of driving in Sicily is quite poor. Usual complaints. Fortunately, there are not many cars on the roads – at least outside of the main towns. They have an unusual system of road markings – there are none. You get to a crossroad and there are no marking on the road. No white line, let alone a stop sign. In theory, this kind of anarchy could lead to very careful driving as drivers anticipate potential problems. But, it seems to be the other way around – they took away the white lines because no-one would pay attention any way. When you think you have right of way, you might not necessarily. 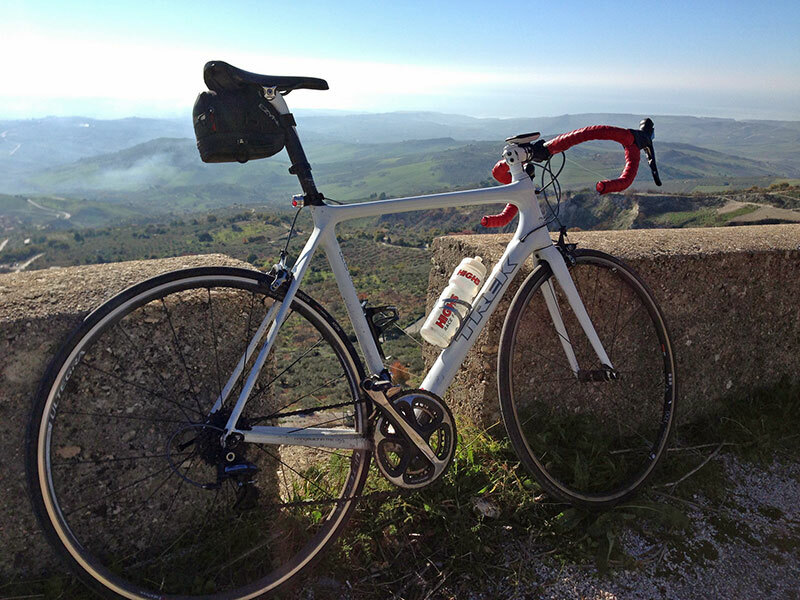 I had a great time cycling in Sicily. One or two near misses with cars was a bit of damper on proceedings. But, on the mountain roads, it was as good as it gets in early January. Hopefully 7 days of riding in 10 days, have helped to shake the winter cobwebs off, and a few more weeks of longer rides, and I might be able to catch up some of lost time from the Nov-Dec period.